Feefo has steadily grown in the last few years and is now regarded as the industry leader in this specific sector. It has earned a reputation as a most reliable and trustworthy source for the online shopper. Buying anything online can be a minefield. Thousands if not millions of suppliers to choose from, many of whom you don't know or have never come across before. Picking the right one for you can be tricky - after all it's not that difficult to build an attractive website, or to make compelling promises about what you can deliver to your customers. So, how can you be sure about who you are dealing with ? Perhaps the most valuable selling aid we have is word of mouth. Increasingly customers come to us because 'a friend / family member just had a sofa recovered in one of your fabrics' or some similar reason - we love this because it shows that customers are quite happy to talk about us to friends and family in a positive fashion, and it hopefully shows that we have given good levels of service and product which is something we always strive to maintain and improve. The next best thing to a recommendation from someone you trust is probably to be able to see and read unbiased, unedited reviews of a particular company, and this is precisely why we chose Feefo as our online review partner. In our case, each customer who either orders samples or bulk material is sent a follow-up email direct from Feefo. In the case of sample orders customers typically receive an email within 5 days of placing their order (i.e., long enough to receive samples), in the case of bulk orders an email is sent a few weeks later by which time it is hoped the customer has used our fabric for whatever project they are working on. These emails are extremely simple in nature as they only ask two questions - one about our service, and one about our product. When customers respond to these emails, their comments are immediately posted online. They do not come to us first. We therefore have no control whatsoever over what is published. We do have the option to post replies or comments to any feedback left which again is immediately visible for all to see. We have found Feefo to be an invaluable tool for our business. Very often decisions we take are based on comments customers have left for us - like any business we are always seeking to improve what we offer and customers make some terrific suggestions or give great ideas on how we can do just this. This, allied to the fact that potential new customers can read dozens of reviews to get a better idea about who we are, makes Feefo a vital part of our business. 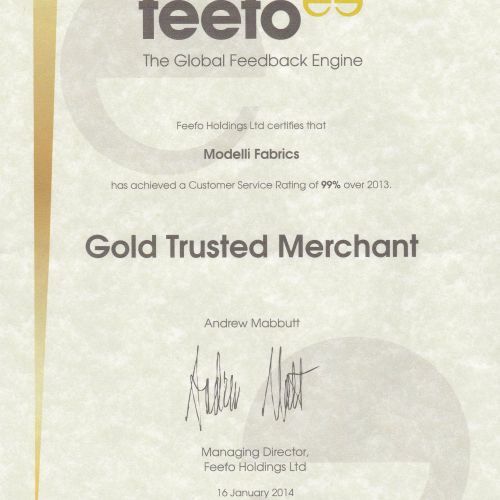 By the way, we are thrilled to say we have been awarded the Gold Trusted Merchants Award by Feefo for our performance during 2013. This is shown above. We do not rest on our laurels however !